It is perhaps not widely known that Bulgaria, a small Eastern European country, has a considerable wealth of ancient sacred sites. The work to uncover them by archaeologists still ongoing and public interest in them has only begun growing in the recent years. “BuzovGrad_Megalith” by Filipov Ivo – Own work. But the lush green and rocky Balkan region has a rich and ancient history, where the spirituality of the sun has been a prominent feature, and it is therefore no wonder that more and more ancient megalithic sites are being unearthed and rediscovered in the area. According to the current belief, most of the ancient sites in Bulgaria are attributed to the Thracian tribes, although the possibility exists that the sites are remains of an even older period and people. The dominion of the Thracians over Bulgaria, the core of their lands, with parts of Northern Greece, European Turkey, Southern Romania, Serbia, and Macedonia included, stretched from the early half of the 4th millennium BC, at the end of the Chalcolithic period to the early Bronze Age, until the 1st century AD. It is interesting to pause here and note that the Thracian religious affiliation was largely to Orphism, an ancient religion characterized by the belief that human lives were considered a “grievous circle” from which an individual needed to liberate him or herself via the growth of the immortal part within (the soul), a simple ascetic lifestyle, and via knowledge acquired through initiatic mysteries, all of which helped an individual to commune with the divine and free oneself from the circle of mundane existence. It is interesting to note that the Thracians revered a rider god, depicted with a spear in hand and frequently slaying a beast or a dragon. Some of the ancient depictions also include a damsel. With the advent of Christianity, the Thracian Rider God transformed into the now iconic St. George slaying the dragon. In a spiritual sense, slaying the dragon or the beast can be symbolic for the slaying of the dark and animalistic nature within through an inner work. Image source: The Thracian Rider God by Klearchos Kapoutsis via Wikimedia Commons under the Creative Commons Attribution 2.0 Generic license. The Thracians appear to have lived close to nature, observed and celebrated the cycles and patterns of the path of the sun through the year in groves, near natural rock formations, rock alters, and the natural elements in general. It is therefore once again not surprising that so many sacred sites and megalithic structures exist in Bulgaria and the Balkan region in general. The most common form of megalith found in Bulgaria is the dolmen. The first dolmens were built in the 12th -11th centuries BC. The era of their construction peaked in the 8th-7th centuries BC, and ended in the 6th-5th centuries BC. The largest concentration of dolmens can be found in the Southern mountainous regions of Strandzha, Sakar and Rhodopi. Together with the Northern regions of Turkey and Greece, the discovered dolmens amount to 1,700. Based on archeological findings, the Thracians practiced sun worship, with some of the megaliths having solar alignments. An integral part of their religion was the worship of the Great Goddess, who they believed created the Universe and ruled over it, as well as gave birth to the Sun. A high concentration of Thracian burial sites can be found in the heart of Bulgaria, the Kazanluk valley, also called the Valley of Kings, or more recently, the Rose Valley. The earliest monument of sun worship in the area is an ancient megalith near the Buzovgrad village, called the Gate of the Goddess, the Solar Gate, or simply, the (Buzovgrad) Megalith. The late renowned thracologsist Aleksander Fol estimated that the Gate of the Goddess dates back to the 2nd millennium BC (1800-1600 BC), but other sources state that the oldest discovered archeological traces point to the 4th century BC. Archeological excavations at the site were performed in 2006. It consists of ten or so large rocks, two of which are positioned on two vertical blocks, forming a trilithon, or a window 1,8 m high. The shape of the window also resembles female reproductive organs. The monument is situated on a rocky outcrop at the foot of the Sredna Gora mountains, 572 m above the village. Professor Fol had identified structures on the site that could have functioned as an altar and a throne. The Koprinka dam can be seen through the Gate, where lie the submerged remains of the ancient city Seuthopolis of the Thracian Odrisi tribe. View of the Bashtin Kamuk from the Megalith. Another significant monument nearby, which is visible from the Megalith, is a monolithic block called the Father’s Stone (Bashtin Kamuk) – the name points to its phallic shape. 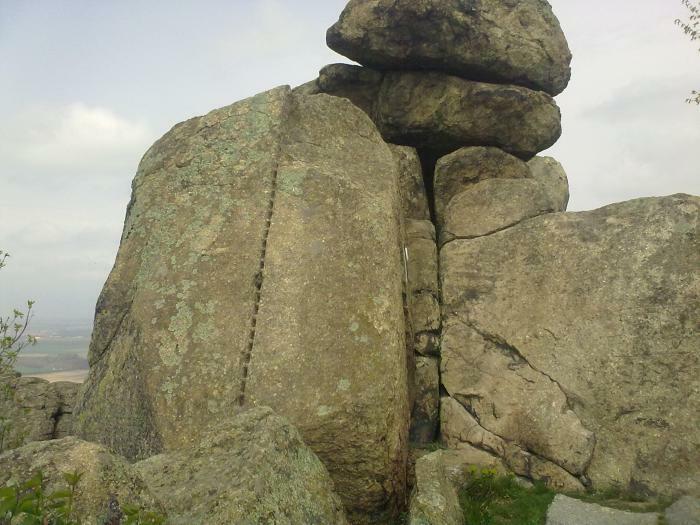 Interestingly, the presence of megalithic feminine and masculine shrines together is not atypical and can be found in many other sacred sites of the world, such as Machu Pichu, many dolmen sites of the U.K. (such as Men-an-tol at Cornwall), etc. The union of those two forces contains a deeper esoteric meaning that ultimately points the way to enlightenment and inner transformation, which is arguably what those sites and sacred structures silently allude to in a powerful symbolic manner. What caught our eye about this site is its precise solar alignment. On the Summer Solstice each year the last rays of the sunset pierce through the Gate. The archaeological interpretation is that the site was used for astronomical observations and calendar purposes, as well as for funerals of Thracian priests and aristocrats. It is also assumed that the site was used for rituals, where it is believed to have symbolized the door leading to the afterlife, functioning either as an entrance to or an exit from the other world. The Thracians associated the sunset with death and the underworld, while the sunrise was associated with birth and creation. “buzovgrad.megalit.03” by Zlatan.Zlatanov – Own work. One interesting element in the Gate of the Goddess structure is a series of holes cut in the rock in a linear pattern on the southern side of the megalith. The significance of these holes is currently officially unknown, but perhaps they served as a mark down, or a calendar of sorts built into the structure? (Have a look at this photo link for another angle of these holes in the megalith for perspective). There has been disagreement on whether the megalith is a purposely built sanctuary or a result of natural forces. Because of the increasing popularity and interest towards the site, by order of the Bulgarian Minister of Culture a special commission was formed to determine its status. In 2012 the commission officially declared it a natural phenomenon, oddly disregarding its solar alignment and Professor Fol’s research. According to Prof. Georgi Nehrizov of the BAN (Bulgarian Academy of Science) National Institute of Archaeology, the monument is a natural formation and excavations revealed no evidence of human habitation or religious function. Nevertheless, people gather there every year to witness and celebrate the alignment of the Summer Solstice sunset with the Gate of the Goddess. So is it a massive coincidental pile of rocks? Or is it an astronomical observatory of the voyage of the sun through the year? Given the location and precise alignments, the research by professor Fol, other nearby ceremonial structures, the symbolism surrounding the structure, along with the long history of the celebration of solar events in the area it seems to us that there’s more to this structure than meets the eye and to reduce it to a simple mere natural occurrence would appear to be a quite a stretch. To experience the spiritual significance of the solstices and equinoxes, visiting a sacred site or celebrating via revived sacred ceremonies is undoubtably the best way to gain an insight into this interesting cosmic process. The Buzovgrad megalith is open to the public and is accessible via the ecotrail that has been recently developed as a tourist attraction to provide easy passage to the Gate of the Goddess. On summer solstice day it serves as a gathering space for anyone interested in observing the miracle of the site’s ancient and precise solar alignment. Witnessing the sun’s rays pierce through the narrow shaft of the square window in the rock of this shrine presents an opportunity for many to explore and experience a celebration of the sun, a connection to its deeper meaning and the forces surrounding this special event in the yearly cycle — a tradition long held by the ancestors of this land in bygone days. Article by Laura Boeva and Jenny Belikov. Research by Laura Boeva, Pavlin Boev, and Jenny Belikov. Original photography by Laura Boeva where specified. Beautiful! It’s so interesting to realise the spirituality behind these places. I remember seeing similar places in Bulgaria but with the meaning shrouded in mystery all I could do is feel there was something special. Thanks for this article Laura and Jenny and Pavlin. I had no idea about this place but it is really interesting. How strange though that the archeologically institute would discount it being purpose built and not leave their findings a bit more open ended. Yes, I also thought it was strange that two experts could come to such opposing conclusions, one that there was no trace of religious use of the site and it being a natural formation, and another that it was a significant religious sanctuary, man made and built to align with the solstice. To me it seems peculiar to conclude that this structure could have come to be by chance. Well done for a great effort with this research. It’s a magical part of the world. It’s so nice to read your information which is included below. How wonderful it would be if people would find their way back to the way it was. Thank you for your hard work to bring us this information.